Two Little Fishies ReVive Coral Cleaner™ is a new product developed by Julian Sprung for cleansing live stony corals. It is a surface cleaning formula based on plant extracts. 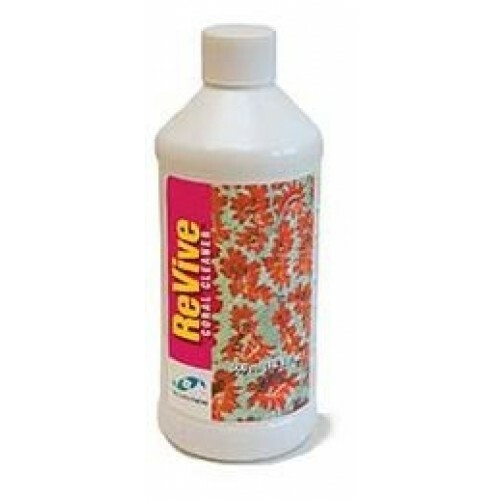 Use for all general purpose live coral cleansing, as a part of acclimation to aquariums when corals are first received, for rinsing prior to shipping, and for rinsing newly fragmented corals. 500 ml (16.8 fl oz) bottle. Directions: Mix 4 capfuls (40 ml) of ReVive per gallon of clean saltwater in a bucket or other container suitable for bathing the coral. Wash coral in this mixture for a few minutes while gently swirling it or use an air stone for agitation. 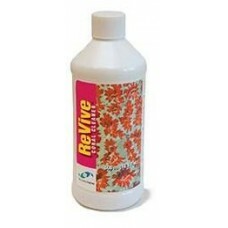 After the bath, remove coral from ReVive/saltwater mixture and place it in a saltwater aquarium with moderate water flow. The ReVive/saltwater may be used again for cleaning several corals, but it should be discarded after 1 hour of use. The aquarist can also use this product to aide in coral that were injured or damaged, like zoanthids and anemones. Follow all instructions when using this product. Note: For cleaning live coral only. ReVive is not a medication, nor is it intended to be a substitute for any medication. Not for use as a household cleaner. Not for human consumption. Keep out of reach of children: Keep cap tightly sealed. In case of contact, wash immediately from skin and clothing with plain soap and water. If swallowed, do not induce vomiting. Drink a full glass of water, and call a physician. Irritating to eyes upon contact. In case of eye contact, flush eyes with plenty of water for at least 15 minutes.